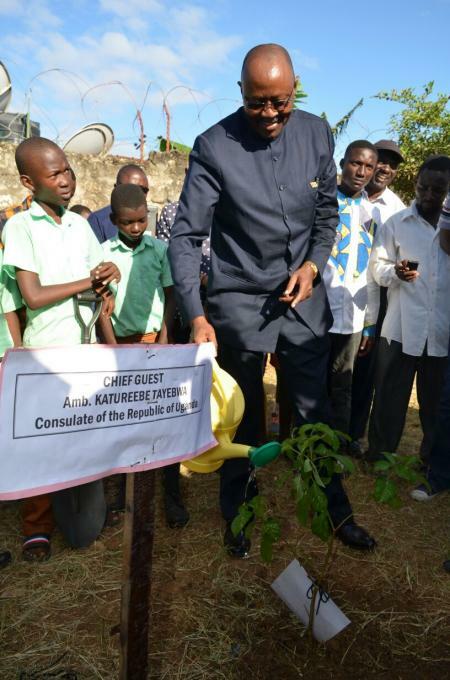 To commemorate Africa Day which is celebrated every 25th May of the year, Ambassador Katureebe Tayebwa, Consul General of the Consulate of the Republic of Uganda in Mombasa led a tree planting exercise that saw the planting of trees at Mtopanga Primary school in Mombasa on 24th May 2018. The event was attended by over 400 people including students, administration of Mtopanga Primary School, National, County government, forest officials, politicians, members of staff from the Consulate and Ugandan diaspora. Addressing the students he stated that they were not only leaders of tomorrow but also of today and as the future of the next generation and must be patriotic , have a sense of Pan Africanism , love forself, for their country and East African integration. He further urged the students and school leadership to ensure that they nurture and look after the trees that were being planted as they would ensure a sustainable clean environment and help address climate change as part of the Sustainable Development Goals on the UN Agenda 2030. He underscored the excellent relations that the two countries Kenya and Uganda enjoy.